The first generation Chevrolet Chevelle was based on GM's A-body platform and they are quite inexpensive in sedan form for a used classic daily driver. Unfortunately the driving dynamics, performance & fuel economy of a stock Chevelle is going to leave a bit to be desired from someone used to modern cars...unless..you pick up a restomodded version. Find this 1965 Chevrolet Chevelle sedan restomod with Chevy LQ4 V8 offered for $16,800 in San Jose, CA via craigslist. 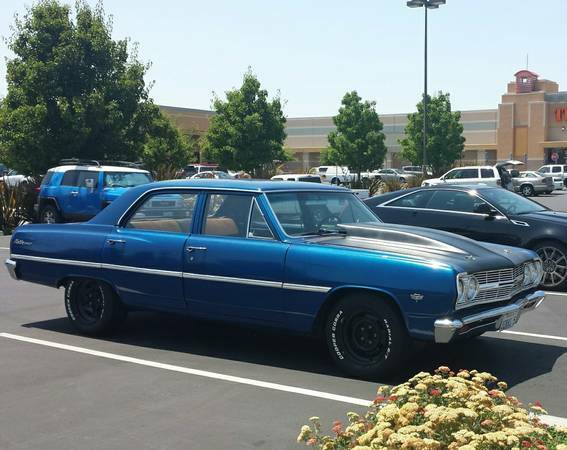 The craigslist ad doesn't offer much info on this Chevelle, but it does give a link to a thorough vehicle description on norcal-lsx.com forums. The modified 6.0 liter LQ4 engine is related to the LS family and is a GM gen III cast iron small block that should be good for 400 horsepower as configured. Wrap the modern V8 in a classic shell with black steelies, white letter tires, and a cowl induction hood and you have a NASCAR-esque daily driver sedan that will likely return your investment with reliability, smoothness and plenty o' power. For the true sleeper look you could go back to a stock-ish wheel & tire package (with hubcaps even), and swap the tall truck intake manifold for an LS2 car manifold (or similar) and likely be able to run a stock hood too. I like the engine swap, firewall, and other upgrades--but on a 4 door?!? I love GM A bodies and I like 4 doors because they are different and usually less expensive. I love the 65 Chevelle but it has to be a 2 door Hardtop for my money.